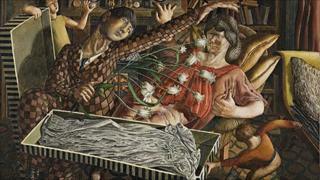 A 1954 painting by Stanley Spencer has set a new auction record for the British artist after being sold at Sotheby's in London for £1.43m. The previous record for a Spencer work was reached in 1990 when his painting The Crucifixion was sold for £1.32m. Hilda and I at Pond Street was expected to fetch no more than £600,000 at this week's 20th Century British Art sale. The painting depicts Spencer at Hilda's home in Hampstead, London along with his wife. The work, which was painted after Hilda's death in 1950, also features two figures which were intended as angelic representations by the artist. The couple wed in 1925 and divorced 12 years later, though they remained close throughout Spencer's second marriage to artist Patricia Preece. James Rawlin, a senior director at Sotheby's, said the auction house was "absolutely delighted to see such an amazing response". The sale, he added, "really helps to establish Spencer as one of the central figures of figurative art in Britain in the 20th Century". Born in 1891, Spencer spend most of his life living and working in Cookham where a gallery of his work now resides. According to Sotheby's, Hilda and I at Pond Street was sold by the Museum of Contemporary Art in Chicago to art dealer Richard Nagy.